Ralph Waldo Emerson is quoted to say "Life is a journey, not a destination." and that is exactly how I feel about my work. Tomorrow marks the day that The Crystal's Call winds to a close, and I feel the need to write something about it. The final posting is already long enough, so I write here instead of at the end as I am usually wont to do. However, this is not a journey that began on August 25, 2013, the first post in The Crystal's Call. To find the start, we'd have to return to May of 2004. It is the summer before my last year of high school and for my birthday at the end of the month I have built a computer to begin my PC gaming. The winter before I had seen my brother in law playing a game that knew I wanted to play. It was Final Fantasy XI, a massive multiplayer online game. Though at the time I found it to be queer that you needed to be a level 60 Red Mage before you could wear the signature hat, I enjoyed the time I got to play as a Tarutaru Black Mage roaming the wide expanse of Sarutabaruta slaying rabbits and mandragora. Final Fantasy had always been a special series to me. My fondest memories of my childhood include renting Final Fantasy III (which I later learned was actually VI) from the local Blockbuster and playing it poorly. I wasn't very good at the role playing game genre until the PSX era. Final Fantasy VII rolled around, and my neighbor owned it and I recall watching him play through the entire game. I had eventually gotten it for myself, though the PC version, and played it over and over. From it grew my love for the series, the worlds that were created, the stories that were told, and the music that brought it all together. I vow that my future children will be raised to appreciate the music of Nobuo Uematsu. To this day, meeting that man is ranked as one of my greatest dreams come true. I am grateful to him for all he has done for the Final Fantasy series, for I feel that without his contribution it wouldn't truly be what it is today. Not that I do not appreciate the music of Kumi Tanioka (Crystal Chronicles), Naoshi Mizuta (Final Fantasy XI), Masashi Hamauzu (Compilation of VII), and the many others, but it was Nobuo who had composed the songs that to this day still make me tear up. The land of Vana'diel was my home away from home, beginning with the Valefor server. I created a Mithra Black Mage named Resha and through my journeys I learned that the greatest friends you can have are those who will stand beside you even when the odds are bad. I left Vana'diel on bad terms no more than a year later as I had a falling out with my best friend and girlfriend at the time. They played as well on the same server, and I couldn't stand to see them in game. It wasn't until April of 2007, after speaking fondly of the game with friends at college, that I returned. I created a new character, my original long gone. This was Rosalynsable, a Mithra Thief of the Titan server who would go on to become a Blue Mage. I met and made many friends, losing just as many along the way. I even left behind the Titan server to Lakshmi where I met some of the greatest people I have ever known. You know them too. Sorael, our illustrious leader who went on to become Oliver Koenig. Ratie, our wise cracking Black Mage. Sorasha and Azarashi. Even Mishro, one of my best friends who sadly still to this day only owns a laptop just barely capable of running XI. We prided ourselves in being some of the best players on the server. Sorael, Oliver, or "Boss" as I affectionately call him, had even been ranked in the top ten players on the Lakshmi server toward the end before our interest in the game waned. Just as Dalamud ended an era in Eorzea, so too did it end an era in Vana'diel. September 30, 2010. Square Enix releases Final Fantasy XIV, their next massive multiplayer online game. It was a flop. I bounced back and forth between XI and XIV 1.0, holding out that the game would get better. I had been graced by some god somewhere and actually had gotten into the Alpha and Beta tests for XIV and the whole time I told myself that it wasn't even the release yet, things would get better. They didn't. It was a quite a while before XIV began to shape into a diamond in the rough, most notably when the entire original development team was fired and Naoki Yoshida, or Yoshi.P as he is most commonly known as, took over as head developer. The game became something that I wanted to invest more time into, despite the toll it took on my laptop at the time (may it rest in peace). My character in Eorzea, with whom you are all aware of, was Rosalyn Sable, a Hyur Archer. There were no jobs when I originally started, only "classes" with strange names. No longer was it "Monk" but "Pugilist". No "Black Mage" but rather, "Thaumaturge". It was a strange system that was just as difficult as the game was to play. Despite the strange mechanics and hardware not up to snuff, I played through the changing storyline and game, until I had completed it, leveling Bard, Dragoon, and White Mage to level 50 in the process. November 11, 2012. Dalamud falls. As the servers shut down and our characters were whisked away to safety, we were promised a realm reborn. All the problems that plagued 1.x would be solved, and we'd have a changed world to explore with new dangers to prevent. We'd have to wait a whole year for the continuation of our cliffhanger ending, but it would be worth it indeed. I continued my adventures in Vana'diel for the year, growing more and more anxious as XIV 2.0 drew closer. Almost in direct competition, mere months before the re-release of XIV, XI brings out a new expansion, and with it a change to the status quo. The game quickly changed into a gear grind, keep up or be left behind, a new and different end game content being released nearly every other month. It became far too difficult to stay standing with the game as the new development team rocked the boat. A small group of skilled players like DejaVu, having no more than eight or ten people on at a time, had no place in a game that required eighteen or more to complete content. August 27, 2013. 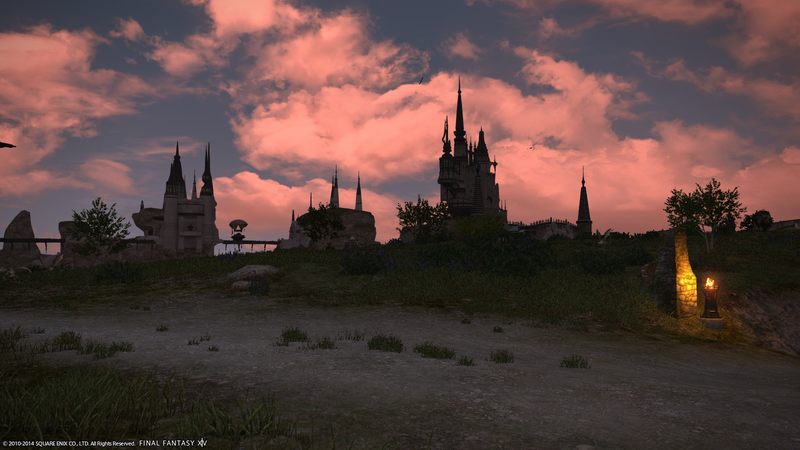 Final Fantasy XIV: A Realm Reborn is released. Despite server issues and stigma, it is a resounding success. No more than a week later, I canceled my subscription to XI. I had been in the Alpha and Beta tests once more, though this time I had been prepared. Just like May of 2004, I had taken it upon myself to build my own PC. This was the first PC I had built since that summer of '04, never needing anything more powerful than a mid-tier gaming laptop before. In remembrance to the the path that had lead me there, I named this PC "Almace", the blade I so proudly wielded in XI. I played through the main story line of XIV hungrily. I needed to know the resolution to the story that I had waited a year for. I tried to pace myself, leveling up the new class, Arcanist, along the way with the story so that I didn't complete it and grow bored with the game like so many people I saw leave within the first month. By now, if you're paying attention to dates, you'll see that my first post of Crystal's Call was two days before the official release, and you'd be correct. Being a Legacy player, I had early access and had made great progress in that week. Originally meant to be nothing more than a teaser, something I wrote because I was pumped and excited to finally be playing the game I had waited so long for. It quickly became something more. My plans changed so many times. I first stated I'd only write up to the end of the final Beta phase, the fight against Ifrit in the Bowl of Embers. Then I said I'd end it after Titan. Pretty soon, I realized that there was only one way this tale could end, and that was in its completion. Though unforeseen issues forced me to take a three month hiatus. I had written the bulk of The Crystal's Call at work, but heightened internet monitoring and blocking by the IT department left me unable to continue. I was annoyed and upset, and had almost given up. After the holidays I knew that I had to keep going. I changed my after work habits, dedicating myself to reaching my goal. It started with one post a week, but that wouldn't be enough. Though I couldn't get out four or five a week, I knew I could do at least two. I stepped up my writing, performing research through the wiki at Gamerescape and the cut scenes that I had at my disposal. The heart of the Crystal's Call has always been the characterization that I breathed into the story. More times than I could count, as I rewatched scenes over and over again, the dialogue began to feel hollow. The dialogue meant nothing, it had no soul. This is not a fault of the writing or the voice actors, in my opinion. It's one of the faults of a silent protagonist. By adding dialogue, both between Rosalyn and the NPCs and Rosalyn and other adventurers, it built a rapport. Toward the end, I was actually beginning to grow fond of Alphinaud, a character I found annoying while playing. Not to forget Cid, who turned somehow turned into a dear friend to me in a way. It seemed like no matter what the situation, I was always able to bounce a line off of Cid. Many of his lines feel like they need a snide remark, a glare, or a chuckle, yet the player is never able to give one. And so tomorrow comes the last post of Crystal's Call for now. I'm really surprised that I had done it. I always wanted to be a writer and here I have done it. After the final edit that will go live tomorrow morning, I have achieved 126,093 words. A staggering amount for someone like myself who often gets hung up long before 50,000. To this day I had never completed a Nanowrimo. Though it wasn't November, I had written the 50,000 word requirement in a month with Crystal's Call. I am really proud of myself for this accomplishment, you really have no idea. But I can't take all the credit alone. First, and foremost, I must really give thanks to the people at Square Enix, their writers and development team who worked so hard to take a dying game and restore life to it. I also must give thanks to the people at Gamerescape, without their dedication to the community I wouldn't have had the majority of the information I was able to use throughout the run. Specifically, thank you Eryiwaen, for being there when I needed to pick your brain. Discussions of lore are always fun, and I'm humbled every time you point something out to me that I missed, even if I don't show it. Last, and certainly not least, I must give thanks to all of you at TAY who have gone on this journey with me. It's been a wild ride and I believe I've learned a lot from it. I hope you all enjoyed reading it as much as I enjoyed writing it. And though this may be the end for now, always remember that, to quote the song, every new beginning is just another beginning's end. Rosalyn's journey is far from over. Thank you, all of you. And may you walk in the light of the Crystal. Linked to enhance your reading of the final post, please enjoy the music.